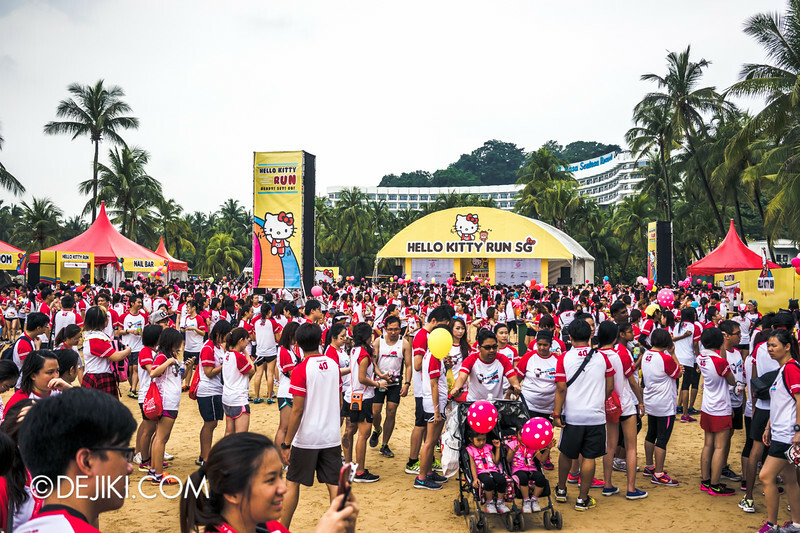 Some 17,000 runners took part in the inaugural Hello Kitty Run Singapore, as part of the 40th birthday celebration for the world’s most famous cat. 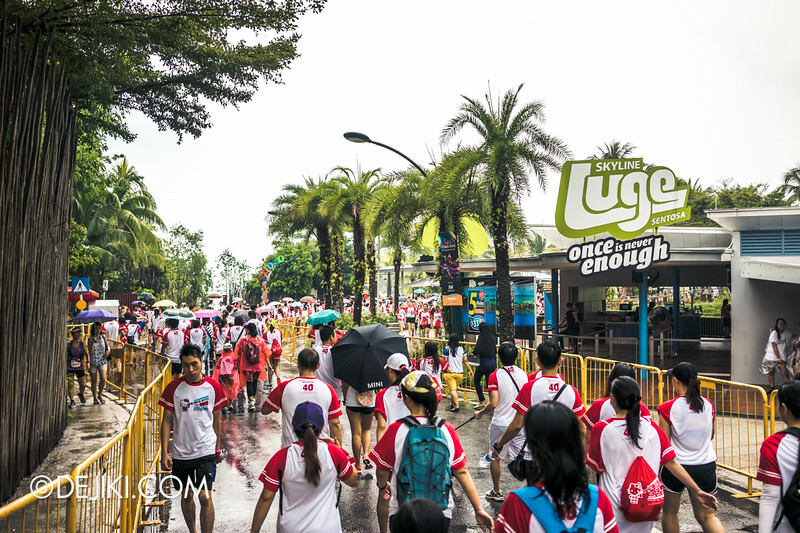 There was never a dull moment during the run, as heavy rain and a chaotic finish turned a leisurely stroll around Sentosa into something quite eventful. Read about it in this event report. Note: This was supposed to be a happy and fun pictorial entry on the run, but I think most runners would agree that it didn’t went well. Murphy’s law haunts us all. 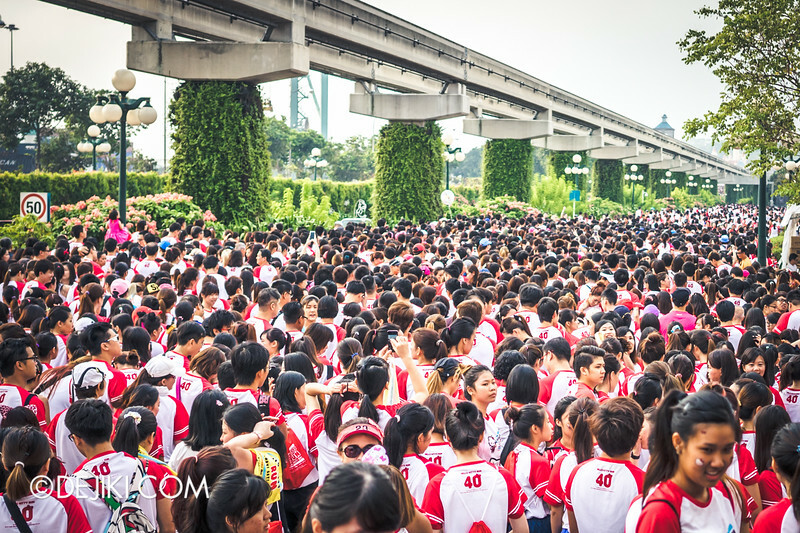 Thousands of runners gathered at the bridge leading to Sentosa. The demographics for this event is unlike most runs – it’s a feel-good bring-your-whole-family event. As we were herded like sheep through the flag-off holding area, dark clouds loomed ahead. It started to drizzle before the flag off… but right after our batch was released, it started to pour. And what happened then was just a blur: There were people running in the rain. Some tried to flag a taxi to get out. Runners without umbrellas and ponchos trapped in shelters. Then there were some who unfortunately fell. The ambulance and safety buggy whizzed past us several times. It took us nearly forty minutes to reach the Beach Station, which is about 2.5km from the start point. 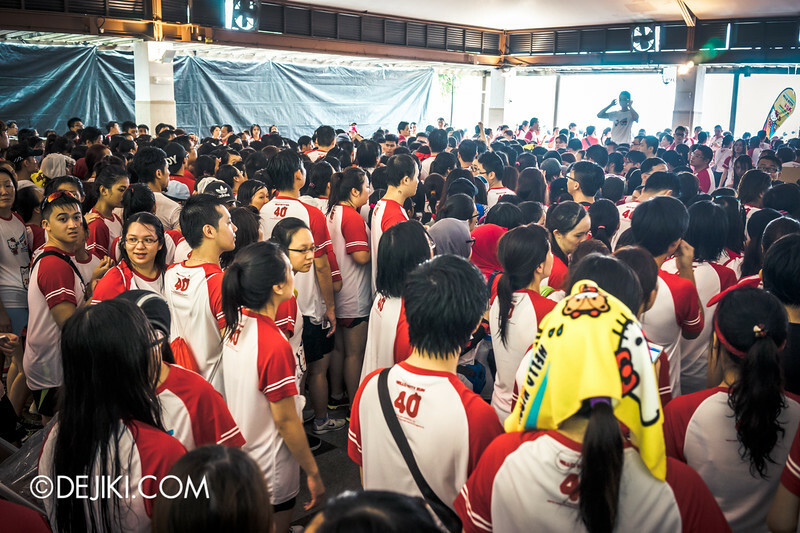 Many participants have already started queuing for the shuttle bus out to Vivocity. 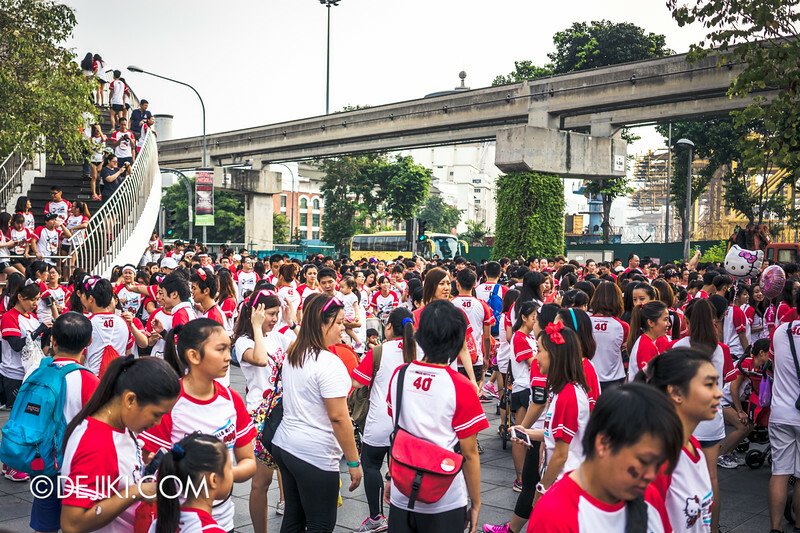 At this point, the event organisers announced on their Facebook page that the run is suspended till further notice. None of the event crew knew about this, though. When the rain lightened to a drizzle, we continued our walk. 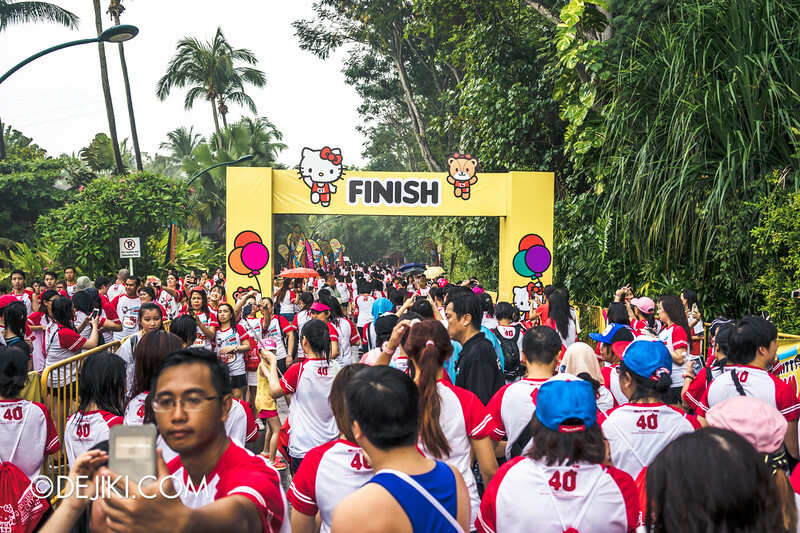 This 5KM fun run turned out to be actually… 3.5 kilometers. As our shoes and clothes were wet, this was very welcomed. It’s an untimed race anyway. Yay – we’re done. And it took us almost 1.5 hours of walking in the rain! Like most people, we continued to the Hello Kitty Beach Party. And get our finisher medals along the way. It was chaos at the medal collection point. Apparently there were people who got to the finish line early and collected several medals. Everyone is entitled to one, but somehow, these people managed to grab 4-5 each (some even claimed, the entire box). 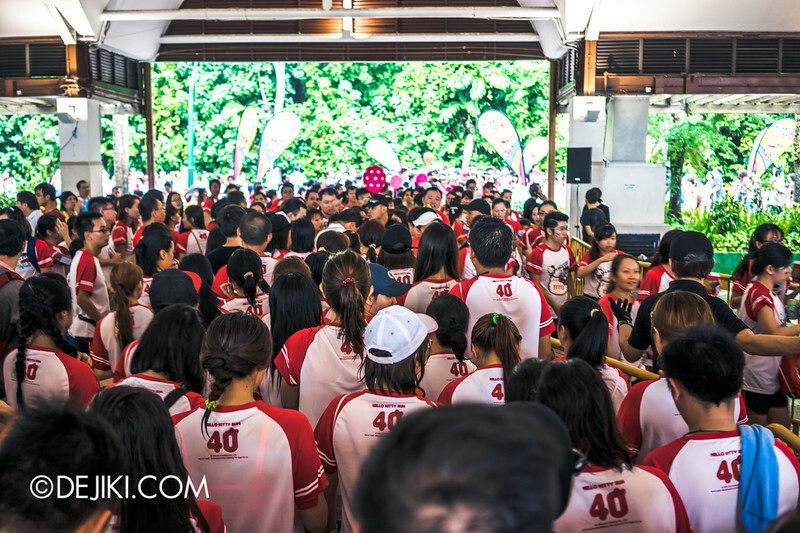 Then there’s mass panic – not everyone will be able to leave with their medal. 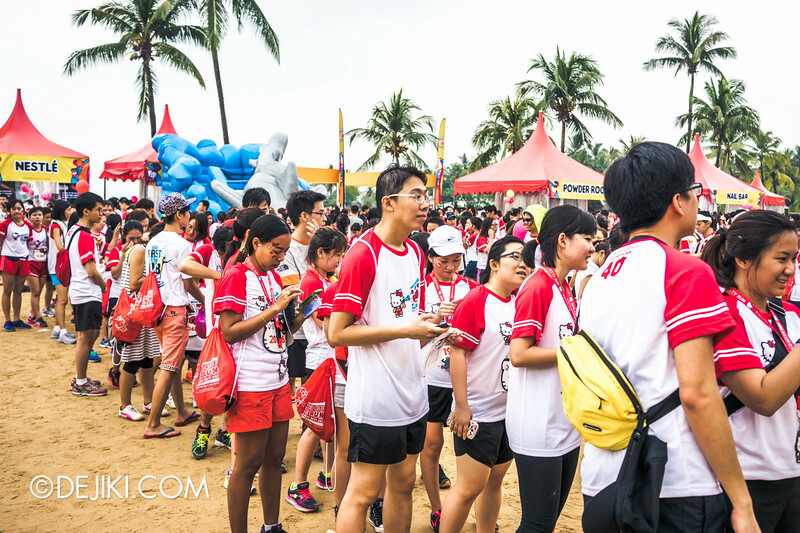 The emcee kept insisting that the crowd to move to the beach party, as the medals will be given out there. 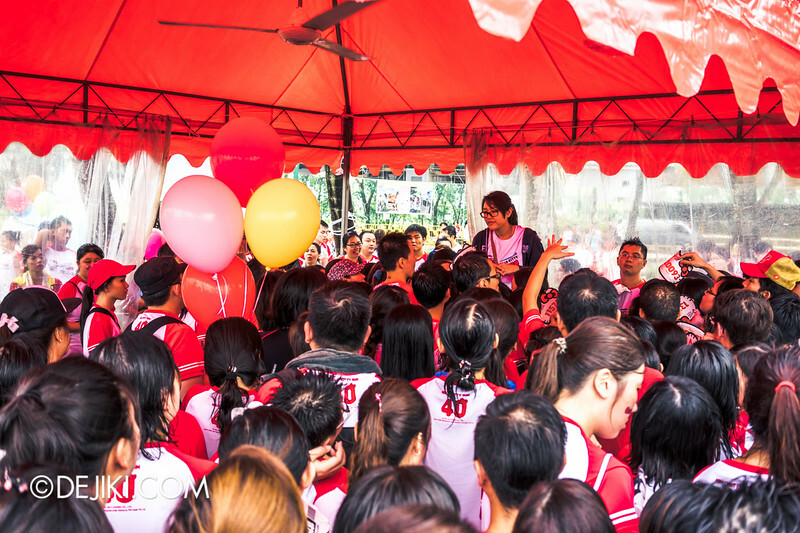 Lots of shouting and pushing… Oh, apparently drinks were given out here (A can of Qoo!) which we almost missed because of the angry mob. We went to the Beach Party area. It was much better – people actually queue up to snap pictures with (rather boring) photo spots. Out of the blue: Somehow word got out that the medals will be distributed at this lucky red tent, which is right beside the stage. 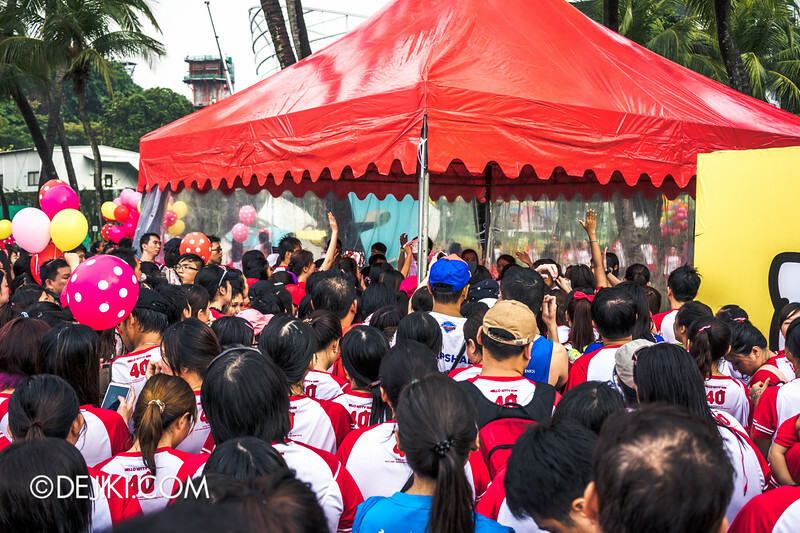 Many people dashed to the tent – a real race indeed. 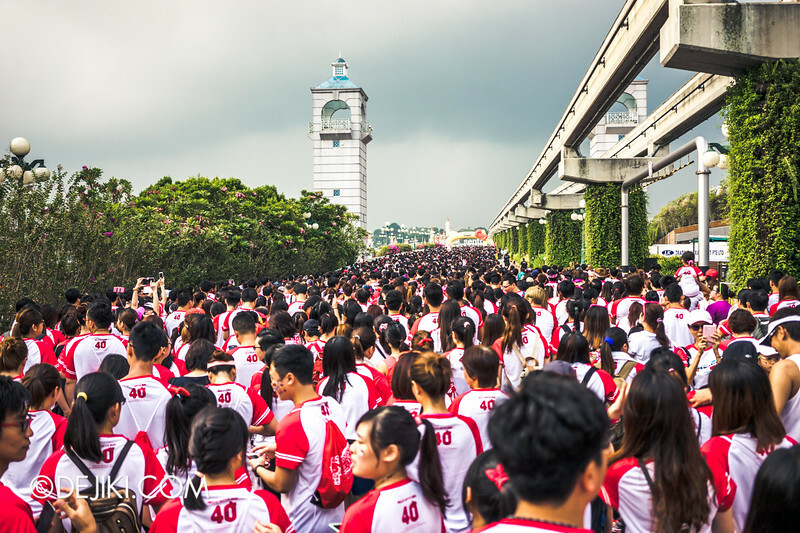 It was a short sprint, as just a handful of medals were distributed, and the participants, tired and angry from all the wait, started arguing with the event crew. The live band was even asked to stop performing. Amid an awkward silence, the microphone was passed to the event crew at the tent. Ah, the sort of answer that makes you want to smash things. We gave up at the angry red tent, which had more drama~ as we left. We figured that the medals will be given out at the original venue, so we went back. We were right. The lax checks in the earlier medal distribution resulted in some participants hauling multiple medals. For this third distribution, the crew also did not check bibs. You could queue again and grab spares. If you didn’t sign up, you could get a medal as well. If they didn’t bother to check your race credentials (which they didn’t), who would know? The event was not that terrible as a whole. 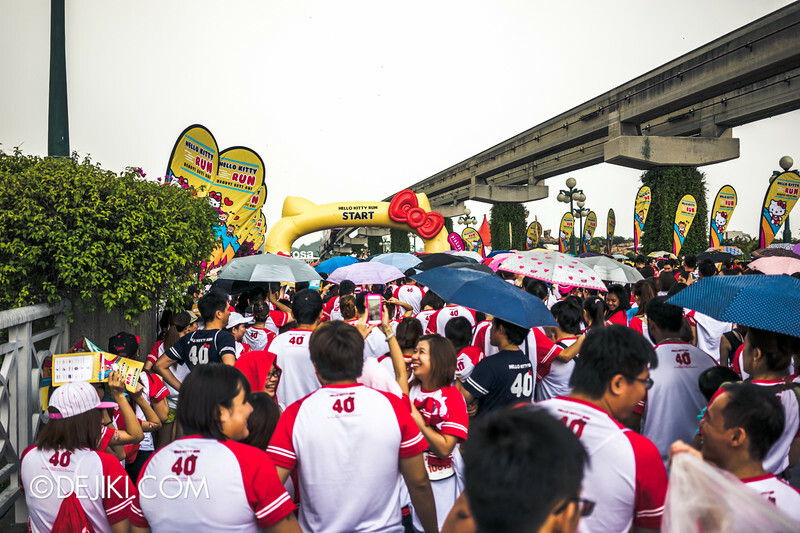 Pink Apple, the organiser, has organised many sports events without such problems. 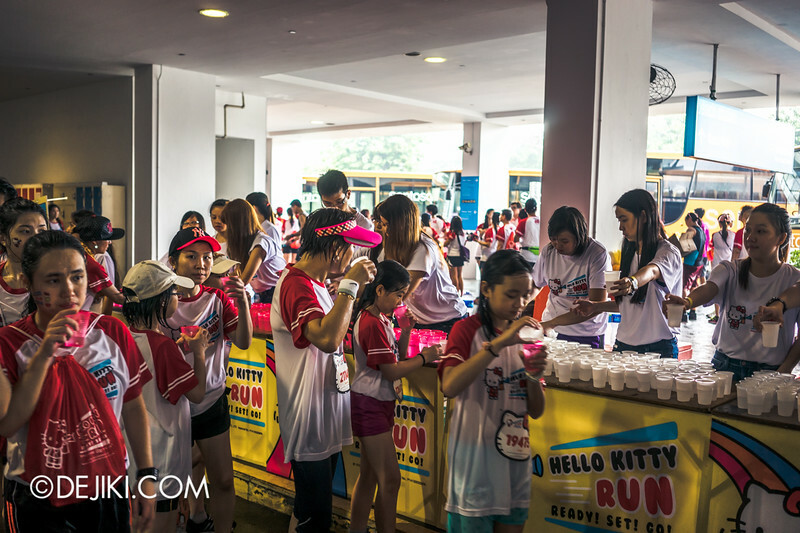 Race Pack collection, T-shirt exchange, and all the pre-race stuff – it all went smoothly. As for the race itself: clearly it was an oversold event. 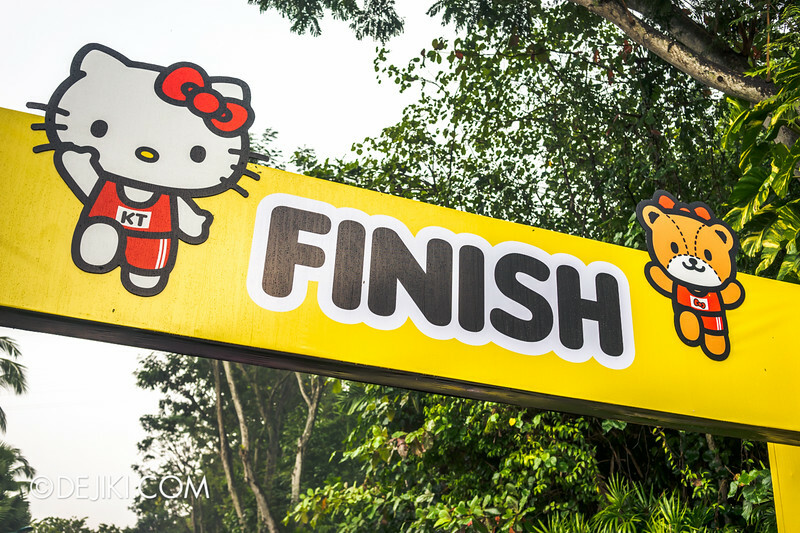 The finish point will not be able to hold 17k people. 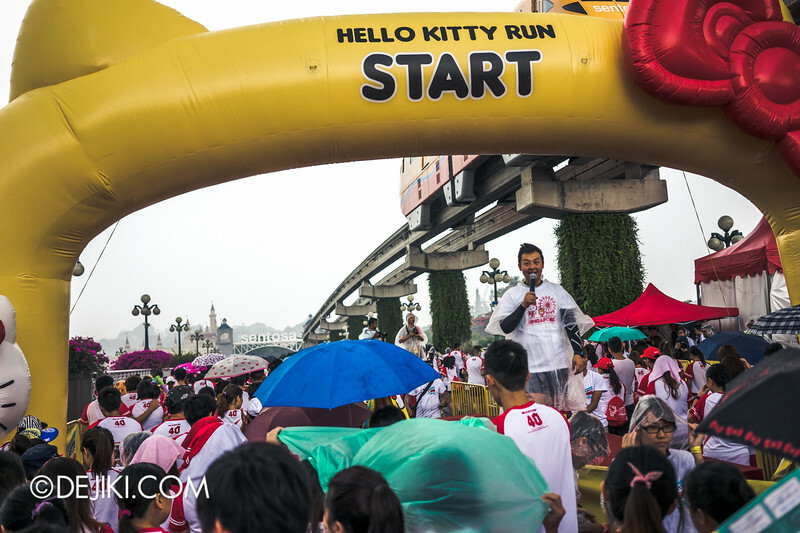 There were too many participants, and the checks at the start and end were very lax. 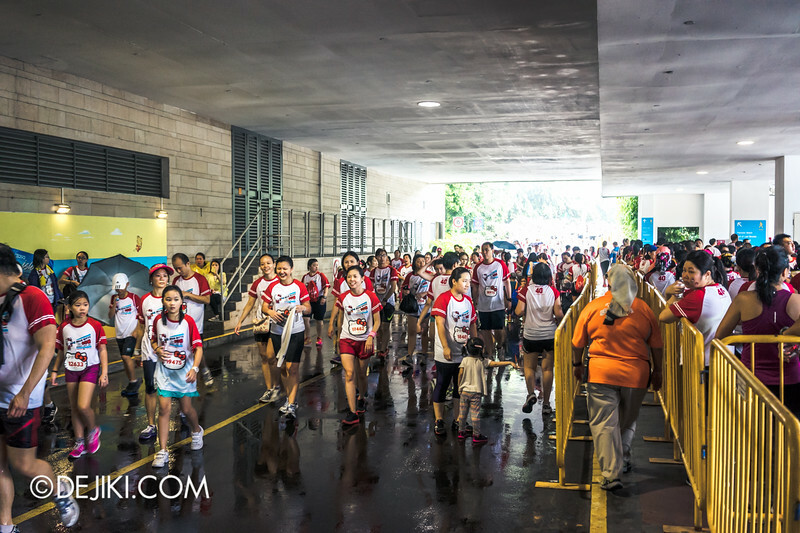 Yes, the heavy rain did cause some issues as the start. 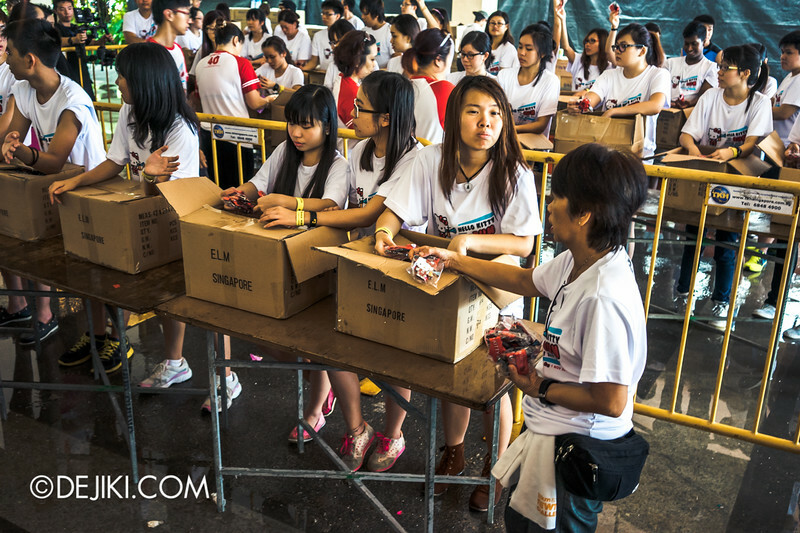 The organiser was quick to respond on social media, but instructions did not trickle down to the ground. There didn’t seem to be a good contingency plan activated for inclement weather. 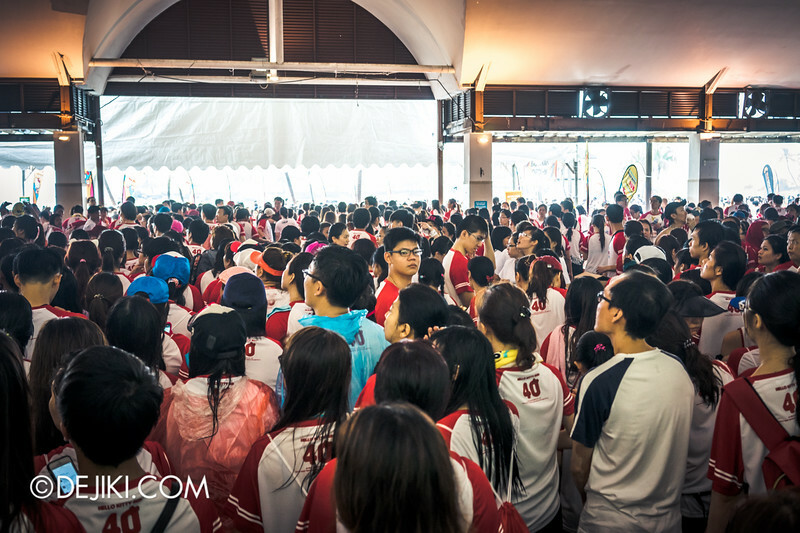 In fact, as many people turned back halfway through the race, there were less people than expected at the Beach Party and Medal collection point. The Post-race is where the event crumbled. 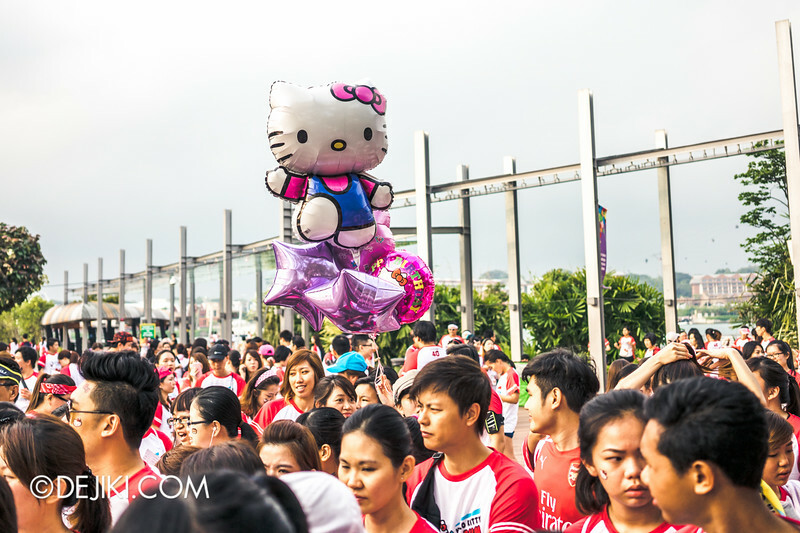 Perhaps no one was ready for the giant mob of casual participants who signed up to get Hello Kitty collectibles (…to resell 10 years later, might be worth something then) and not the “race experience” or “Hello Kitty 40th Birthday celebration”. The fact that the crew did not check at the third distribution just showed that they couldn’t care less. Everyone’s tired from the rain, and dealing with angry people who just want more trinket(s)… there’s more to life than that. 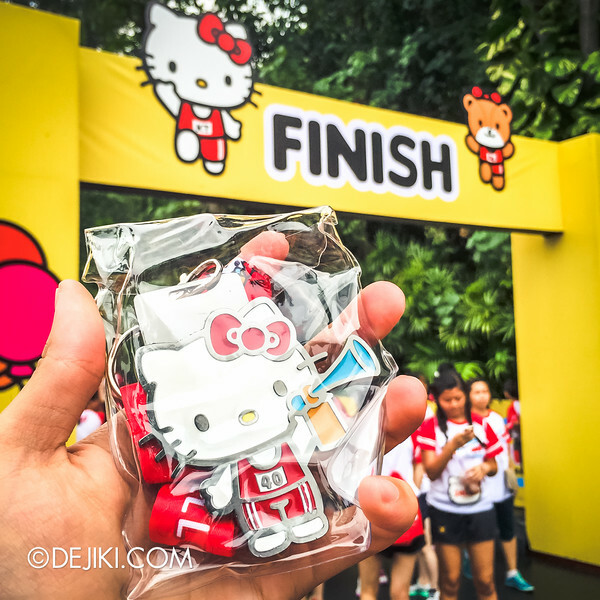 The event organiser will keep participants updated over medal collection at the Hello Kitty Run SG Facebook page. Yes, we got our medals – one for each of us. A mark of conquering that short distance in the rain, and surviving the angry medal nightmare. It’s just unfortunate that the whole event became so centered about getting things and not much on Hello Kitty’s Big Four-O anymore. That sounds really unfortunate! Although I can’t blame the organizers entirely (since the chaos was partly driven by the greed of some to turn this into a money making opportunity and the creation of Carousell *haha, I don’t really blame them*), I guess many of the things could have been prevented. The damage control also seems terrible. It is ok to mess up, no one expects perfection. But often, what is judged is the ability to admit mistakes and perform top notch damage control. As for the rain, not enough chilli padi?